Spend your Spring Break with Discovery Place! Home Education	Spend your Spring Break with Discovery Place! Are you planning a Spring Break 2015 Staycation? We have the PERFECT activity for your kids to give you some free time. 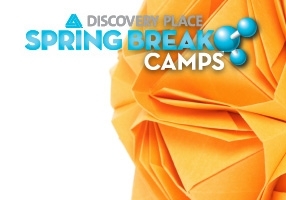 Back by popular demand, we bring you Discovery Place Spring Break Camps! Full-day Camps will be offered April 3 – 10 and are structured exclusively for elementary school students. A range of Camp themes are available for students in grades K-3. From cooking and chemistry to animals and astronomy, Discovery Place is ready to turn your Spring Break into a scientific adventure! All Camps run 9:00 a.m. – 4:00 p.m. and are held at Discovery Place in uptown Charlotte. Sign up for individual days or a whole week of fun and learning! – Full payment must be made at the time of registration. – Emergency medical form must be completed and returned at least two weeks prior to the start of Camp. – Cancellation notice of 3 weeks is required for a full refund. – Programs with low enrollment 3 weeks prior to the start date are subject to cancellation. Minimum enrollment is required to run each Camp. If cancellation occurs, the family will be notified and given the opportunity to select another Camp or receive a refund. – Lunch care is offered free of charge from noon – 1:00 p.m. when booking a Camp. – Kids may bring a nut-free bag lunch. Discovery Place Spring Break Camps are nut-free zones for the safety of all of our Campers. Please pack all lunches accordingly. – Snacks will not be provided during Camp, but a short snack time will be allotted in the morning and in the afternoon of every Camp. You may send two nut-free snacks with your child each day. Discovery Place Spring Break Camps are nut-free zones for the safety of all of our Campers. Please pack all snacks accordingly. Click here to learn all about Spring Break Camp options.